The crew of the U.S.S. Dwight D. Eisenhower re-created the trailer for “Star Wars: The Force Awakens” to impressive effect in a parody released Thursday. “Sea Wars: The IKE Awakens” trades in the film’s cast for crew members, X-Wings for Navy jets, and the droid BB-8 for a mop bucket. With the film’s score and a few special effects to add in Kylo Ren’s three-pronged lightsaber and some TIE fighters, the parody nails the look and tone of the film’s first teaser. According to the Washington Post, the parody was created by Mass Communication Specialist 3rd Class Alex Delgado, a sailor on the ship. “The Force Awakens” is directed by J.J. Abrams and stars John Boyega, Daisy Ridley, Adam Driver, Oscar Isaac, Andy Serkis, Domhnall Gleeson, and Max von Sydow, with Harrison Ford, Carrie Fisher, Mark Hamill, Anthony Daniels, Peter Mayhew, and Kenny Baker reprising their roles from previous “Star Wars” films. 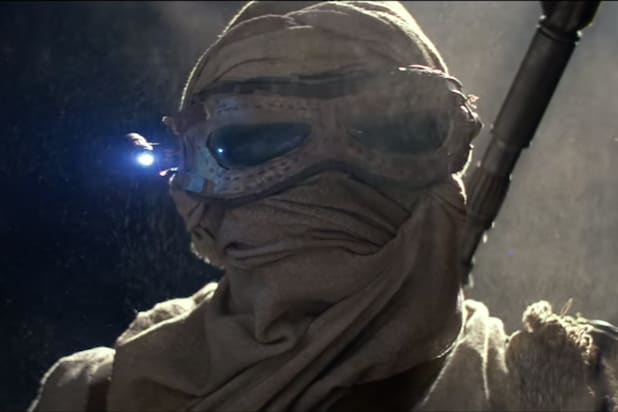 The highly anticipated seventh installment in the “Star Wars” franchise hits theaters Dec. 18. 1. "Who are you?" This is our first glimpse is of Rey (Daisy Ridley) dressed in heavy-duty sand planet gear, fitted with repurposed lenses from a Stormtrooper helmet. The Force is strong with this one! 2. Kylo Ren (Adam Driver) is the ultimate fanboy -- he styles his look after the Dark Lord of the Sith and keeps Darth Vader's charred helmet on a plinth. Ren is clearly in hero-worshipping mode. 3. "I've got nothing to fight for," says Finn (John Boyega), which should put to rest any theories he's not a real Stormtrooper. The trailer paints him as a soldier of the New Order who no longer believes in the cause. 5. We finally see our first glimpse of Leia Organa Solo (Carrie Fisher), being consoled by her husband, Han (Harrison Ford). Is Luke's mysterious absence from the film's promotional materials the reason she's sad? 6. The closest lead we have on the whereabouts of Luke Skywalker (Mark Hamill) is this shot of a robotic hand resting on R2-D2. Other than that, your guess is as good as ours. 7. Many believe that the mysterious voice bookending the trailer ("Just let it in") belongs to Maz Kanata (Lupita Nyong'o), who was possibly featured on the film's poster. 9. Is Oscar Isaac's Poe Dameron under mind control? Bear with us as we piece together the evidence for our first crazy theory. An earlier teaser showed Resistance fighter pilot Poe Dameron (Oscar Isaac) sporting a familiar worn jacket. Comic-Con footage let us view a shot of a captured Poe being led by a Stormtrooper to an uncertain fate. Could that possibly be Finn holding Poe at blaster point? In the new trailer, Ren subjects Poe to a new kind of Force torture (not a Force choke as some fans think, as that particular move makes it impossible to do anything other than gag). Finn later crashes down on a desert planet, now in possession of Poe's jacket which he seems to wear through the rest of the film. When Poe encounters Finn again, he doesn't seem to recognize his jacket. In fact, the look on his face seems menacing. Finn, meanwhile, seems to know something's up. Is the Force telling him something?